For over six thousand years, since the early days of the Magan civilization in the fourth millennium BC, Omani seafarers and merchants have traversed great distances, reaching both East Africa and Canton, China. 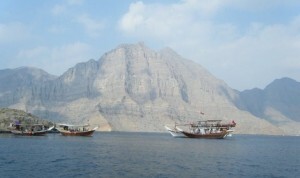 Drawing upon Oman’s unique geographical location, at the mouth of the Indian Ocean and the Arabian Gulf, where the continents of Asia and Africa meet; the ancient Omanis developed historic trading centers in Muscat and Sohar as merchants sought to link East African sea routes with Arabia, Persia, India, and China. With them, the ancient Omani merchants brought precious metals, perfumes, and wood while returning to their land with silk and porcelain. By the tenth century, the port city of Sohar, tucked away outside the Gulf and shielded from seasonal winds, rapidly developed into a trading hub where ships stopped for supplies while waiting for suitable winds to continue their journey. Consequently, Sohar grew into a prosperous trading center where flourishing glass and textile industries were developed, and from there glass bottles and clothing were exported to Yemen and Africa. 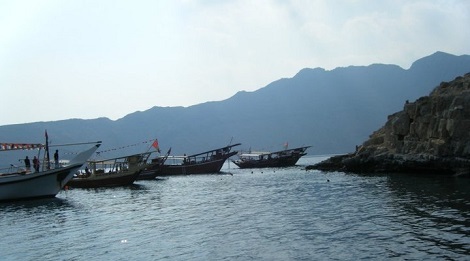 In an apparent bid to link Oman’s maritime history to forging strong present day diplomatic ties with India, China, and Singapore, Muscat has since the 1980s supported three major sea bound ship construction projects. Most notably, in 2008 the Omani and the Singapore governments began a joint venture towards constructing a ninth century Omani merchant ship inspired by the design of the Belitung shipwreck, an Omani Dhow found off the coast of Belitung Island, Indonesia in 1998. Drawing inspiration from the salvaged Belitung shipwreck, the newly constructed ninth century vessel was named The Jewel of Muscat. Adhering to strict historic Omani shipbuilding techniques, two short years after the project was launched, the Jewel embarked on a sea voyage to Singapore where it was gifted to the people of Singapore. Aside from using a modern day GPS system, the Jewel strictly adhered to ninth century navigation practices while sailing from the Sultan Qaboos Port in Muscat into the Sea of Oman. From there, following ancient trade routes that opened up for today’s global economy, the Jewel sailed through the Arabian Sea, along the western coast of India, around Sri Lanka, across the Bay of Bengal, and through the Straits of Malacca, arriving in Singapore in July 2010. Aside from the Jewel’s successful voyage, the ship also played an important diplomatic role towards forging friendly ties between Oman and Singapore as the two countries have since deepened bilateral cooperation primarily focusing on business and tourism. Additionally, political and diplomatic consultations are held on a regular basis, revealed Oman’s United Nations Ambassador, Lyutha Al-Mughairy. Prior to taking up her post at the United Nations, Al-Mughairy chaired Oman’s joint working group with the Singapore government where she was responsible for the Jewel’s ultimate success. As a testimony to how shared values with a particular emphasis on education and economic development have culminated in robust diplomatic ties, Singapore officials frequently refer to Oman “as the Singapore of the Middle East,” Al-Mughairy reveals. During historical times, Omani seafarers, en-route to and from China, would stop in what is known as Singapore’s “Arab quarter,” where they would rest and wait for suitable winds before resuming their journey. Inevitably, commercial goods were also exchanged there. Building on the Jewel’s diplomatic accomplishments, Singapore and Omani officials inaugurated “Muscat Street” in the heart of the city’s historic Arab quarter last month with glamor and fanfare. At the inaugural ceremony of Muscat Street, Sayyid Badr Al Busaidi, the Secretary General of Oman’s Ministry of Foreign Affairs, emphasized that through international cooperation, “Oman can have an impact much larger than its size.” On a similar note, Singapore’s Minister of Foreign Affairs, K. Shanmugam, underscored how historic ties between the two peoples can serve as an important catalyst for forging stronger ties. 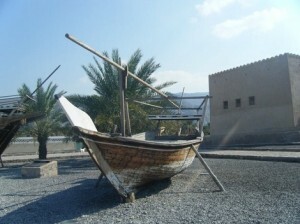 In addition to the Jewel, the Museum of Culture and Heritage sponsored the construction of two additional seabound historic vessels, the Sohar (1980-1981) and a boat from the Magan civilization (2005-2006). While the Sohar sailed to China, where it was gifted in honor of the two countries deep maritime history, the Magan boat sank off the coast of Oman en-route for India. Following the Jewel’s successful but demanding Indian Ocean voyage, the Omani government allocated additional funding for reconstructing a series of historic model ships as part of an overall effort to preserve its maritime history while passing on traditional shipbuilding techniques to the next generation of Omanis. Under the auspices of The Qantab Institute, an impressive number of skilled master carpenters, hailing from India, Oman, and the West, are currently intensively working towards constructing a series of traditional Omani model ships. Qantab Director Dr. Erik Staples, a University of California educated specialist in Islamic shipbuilding traditions, reveals that his institute employs a staff of 30 skilled shipbuilders and master carpenters working out of dockyard facilities outside of Muscat and Salalah. Inside his office, overlooking the Arabian Sea, Staples describes how his team is currently constructing a traditional Omani vessel known as the Baden Seyed, a historic ship primarily used for fishing and cargo. In accordance to a historic Omani shipbuilding tradition, carefully following a drawing by the nineteenth century French Admiral Francois Edmond Paris, Staples reveals how his crew are meticulously reconstructing the ship made out wood while stitching it together with date palm and coconut fiber. Once the full size vessel is completed, the ship will prominently be featured at the Museum for Maritime History, a part of the country’s Museum of Culture and Heritage. The new institution is scheduled to be inaugurated by the end of 2013, Staples says. In addition to the Baden Sayed, Staples and his men are also constructing two smaller vessels, a boat dating back to the Magan civilization and a second Shasha raft made out of reed. Once the 4.5 meter long Magan boat is completed, the vessel will also be stitched together with coconut and date palm fiber by Qantab’s skilled shipbuilders. The construction of the Shasha has meanwhile been subcontracted to an older Omani man as part of an effort to revive the little known building techniques of the traditional raft. 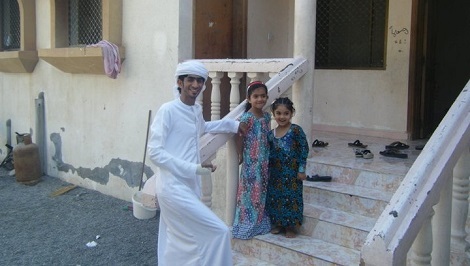 Staples and his men are also assembling three partial models; one of them being a twentieth century ship known as the Fatah al Khair, which, once completed, will be stitched together by coconut and date palm fiber. Additionally, two models of an 8-12 meter Batille ship are also being constructed; one of which will be stitched together in line with coconut and palm fiber tradition, and the other with nails. Staples subsequently revealed that his institute also intends to construct a scale model of the following traditional Omani vessels: The Beden Saffar, The Gharookuh, and The Baggalah. Meanwhile, celebrating the three diplomatic ship initiatives prompted by the Sohar, the Magan boat, and finally the grand success of The Jewel of Muscat, the Qantab Institute is currently constructing a scale model of each of the ships. Once constructed, all of them will be stitched together by coconut and palm date fiber. Adhering to Oman’s quest to link its rich maritime heritage to its diplomatic history, Staples’ center is currently also planning on constructing a scaled vessel of The Sultanah, a merchant ship dispatched by Sultan Sayyid Said bin Sultan Abu Said to New York in 1840. Additionally, The Qantab Institute is also planning on constructing a scaled model a of a traditionally sewn Dhofari boat known as the Khambari and of a regional vessel known as the Sambuq. Deviating from the coconut and palm date fiber shipbuilding tradition, all the three scaled models will use nails. Ahead of the much anticipated 2013 inauguration of the Museum for Maritime History, a part of the Museum of Culture and Heritage, Staples and his men are also constructing a series of traditional Omani navigation tools. Neubauer has six years experience in strategic communications, public diplomacy and research focusing on American foreign policy towards the European Union and the Middle East from both the U.S. defense industry and from the NGO sector.Currently, Neubauer prepares customized business intelligence reports for top-level corporate and government decision makers for a northern Virginia-based consulting firm. Previously, Neubauer covered global defense and Israeli security related developments for SOS International Ltd., a privately held operations support company providing information engagement, intelligence solutions and stability operations support to U.S. government and commercial clients. From 2007-2010, Neubauer successfully managed Young Professionals in Foreign Policy's diplomatic relations program. In that capacity, he moderated/supervised high-level discussions with ambassadors posted to Washington, DC and to the United Nations on issues related to bilateral dialogue and multilateral engagement. Neubauer is frequently invited to address international conferences and has lectured at universities across the United States on issues related to Mideast security. In 2012, he presented a paper on Gulf security at a NATO Maritime Security Workshop in Marmaris, Turkey. In addition to various scholarly publications, Neubauer has also contributed to leading international media outlets, including ABC News, CNN, Fox News and the Huffington Post. Fluent in seven languages, Neubauer is a graduate of Yeshiva University in New York where he studied Jewish history (MA), political science (BA) and French literature. Neubauer is a member of the International Institute for Strategic Studies, is married and has two children.